What is to be done about the four million people in Assam who failed to get into the draft list of the National Register of Citizens (NRC) that aims to determine who are legal citizens? The NRC will hold another round of counting, giving those missing from the draft list a second chance to prove their citizenship. But even if the NRC blacklist halves to only two million people, what next? Bangladesh will refuse to accept them. Keeping them permanently in refugee camps would be a monumental tragedy and probably impractical. The best solution is to resettle them in other Indian states that are short of farm labour, and hence willing to receive workers. As a libertarian, I instinctively favour the free movement of people. I share the fear of critics that the NRC process will throw out many genuine Indians who happen to be Bengali-speaking or Muslims. In a semi-literate country, lack of documentary evidence is common. The law says that anybody from Bangladesh who entered until 1971 will be deemed Indian, but later arrivals will be deemed foreigners. So, millions who came after 1971 will be thrown out, even if they have worked and lived in India for decades. That would be a humanitarian debacle. A large country like India should be willing to absorb an inflow from neighbours that is a negligible proportion of the Indian population of 1,300 million. Problem: the inflow is far from negligible as a proportion of Assam’s population of 32 million. Muslims constituted over 34% of Assam’s population in 2011, up from 30% in 2001, and have become a majority in some border districts. One cannot ignore communities fearful of being overwhelmed and converted into a minority by newcomers. Tripura historically had a tribal majority, but now has a Bengali majority thanks to migration. In Sikkim, Nepali migrants overwhelmed the local tribal population and became the political masters. These examples have made the rest of the northeast paranoid about being overwhelmed by newcomers. Bhutan, supposedly the land of Gross National Happiness, has thrown out lakhs of Nepali settlers for fear of being overwhelmed. Meghalaya seeks to expel Nepalis too. Nagaland is determined to keep out outsiders. In theory, people should be free to travel, own land and vote in any part of their nation. Yet nationbuilding is still a work in progress in India. In 1947 Churchill declared that India was just a geographical entity and was no more a country than the equator. Since 1947, India has proved Churchill almost entirely wrong by creating a unity across territories that was never guaranteed. But this required delicate political handling, and the creation of exceptions in sensitive areas. That sensitivity is required for any peaceful humanitarian settlement of issues in the northeast. 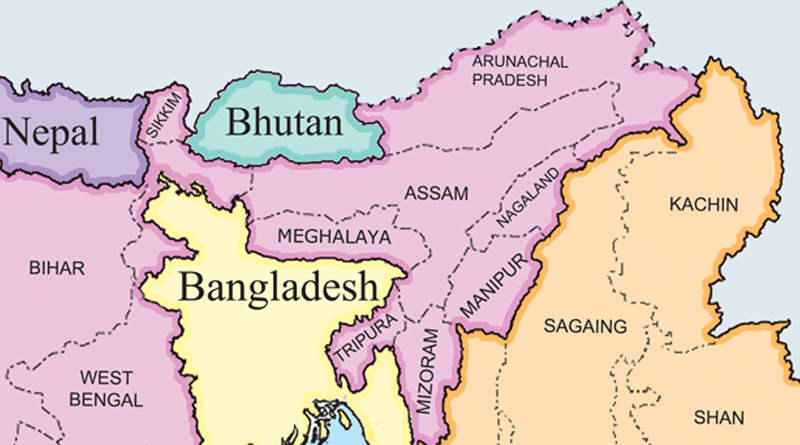 Absorbing Bangladeshi migrants should not be a problem for a large country like India, but is a problem for small regions in the northeast fearful of being overwhelmed. One answer is to resettle immigrants in other states. Although unemployment is a problem, especially for the educated, farmers everywhere complain of an acute labour shortage. Once, Biharis migrated to labour-scarce states as farm workers, but today agricultural labour is scarce even in Bihar, so harvester combines have entered the state. Construction companies also complain of scarce labour. Traditionally, a lot of agricultural and construction work was done by women. But since 2004, more than 40 million women have withdrawn from the workforce. Some are studying in school or college, but most stay at home because their family incomes have risen, and withdrawal from manual work improves their social status. Families whose women work in the fields are looked down upon, and do not attract desirable husbands for their girls. This has induced mass withdrawal of women from manual occupations like agriculture and construction. This creates a favourable climate to resettle illegal immigrants in areas with scarce farm labour. The BJP will oppose this tooth and nail: it sees the immigrants as undesirable Muslim intruders to be expelled wherever they are found. Non-BJP parties will, hopefully, band together to change that policy. Many village communities in the rest of India will be suspicious of immigrants. Yet migrants from Odisha and Bihar have long been able to find jobs in south India and Punjab. Bangladeshi migrants will more easily move to areas where they have brethren. Clusters of immigrants can be created in other states, but the BJP will oppose them. These are formidable practical difficulties. But they are perhaps no more formidable than corralling millions of immigrants into refugee camps and keeping them there. ← Does suited-booted sound more corrupt than khadi-Gandhi cap?